If you're doing something like traveling with your bike, either by plane or having it shipped somewhere, you'll have to disassemble it before boxing it up. While you could pay a professional at your local bike shop to do this, it's fairly easy to do on your own. 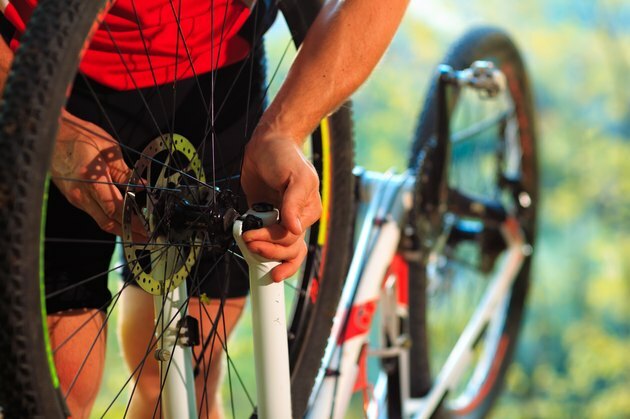 If you have a few simple tools and an hour or so of time to spare, save the cash for your trip and disassemble your bike yourself. Deflate your tires and use the Allen wrenches to remove any accessories that stick out from the bike's frame. These could be water bottle holders, a bike computer or lights. Remove the pedals. Shift the chain onto the smallest chainring and largest rear cog. Using a pedal wrench, remove the right pedal with a counterclockwise motion. The left is reverse-threaded, so use a clockwise motion with the pedal wrench to remove the left pedal. Take off the saddle and seat post. Use an Allen wrench to remove the saddle and place the bolts and washers in your storage bag. Use an Allen wrench to loosen the bolt around the seat post. Once it's loose, remove the seat post by pulling it upward. Create slack in the brake cables. On a road bike, simply open the quick-release lever of the front brake. If you're disassembling a mountain, touring or hybrid bike with cantilever brakes, release the cable ends of the front brake. Remove the front brake by using the Allen wrench to unbolt it from the fork. Store the bolt and washer in the storage bag or reattach them to the brake. Remove the handlebars, which are held into place by the stem. Loosen the bolts on the stem with the Allen wrench. You'll likely need to completely remove the bolts in order to take the handlebar off. Place the bolts in the storage bag. Take off the front wheel by unscrewing the quick-release mechanism on the front wheel and removing it from the fork. When disassembling to fit a bike into a box, it isn't necessary to remove the rear wheel. If you're boxing your bike up, it's important to securely position a fork protector block between the dropouts to prevent damage to the fork. Make sure you pack tools in the box for reassembly. Carefully tape the seams of the box to reinforce it and write the destination address on the box. This way, your bike won't get lost if the shipping label gets damaged or torn off. The shipping or flying process can be unforgiving to packages. If your expensive carbon bike is inside one of those boxes, it's unlikely that package handlers will notice. Make sure that all of the components and the entire frame is carefully padded with foam or bubble wrap. It's also a good idea to wrap cardboard pieces around the frame tubes to prevent nicks or scratches during transit.